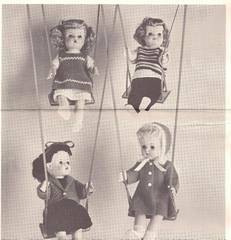 Home Needlework Instruction McCall's Toddler Dolls Knit Wardrobe Pattern 15" 17"
McCall's Toddler Dolls Knit Wardrobe Pattern 15" 17"
McCall's Knitting pattern No. 596-NB for four outfits shown. Designed to fit 15"-17" toddler dolls.